In the spirit of determination, courage and fun, I pulled out my beloved bicycle this week for a short spin around the block. It’s been years since I’ve been able to ride. I cannot say it was an easy feat, but I thoroughly enjoyed the exhilaration, movement, freedom… and the cool bay breeze blowing through my hair. Biking has always been magical to me, and had been one of my favorite physical outlets since I was small. Something special about speeding around on 2 big silver wheels! Even though I am still struggling with instability of my hip joint (which refuses to stay in its proper place within the socket), and constant severe pain, I can say my muscles are most definitely stronger for having done the 6 week rehab program in Chicago, and I continue to do my homework several hours per day. 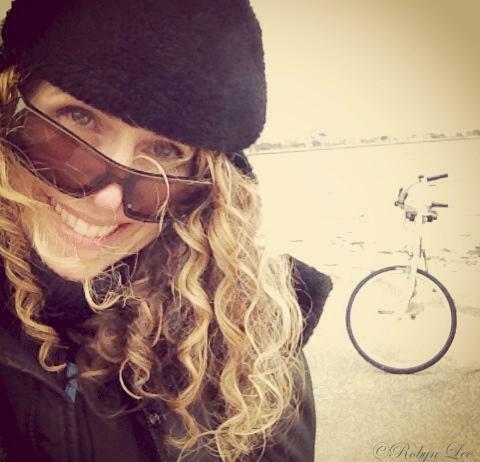 There is yet more to overcome, but I am still hoping to coax my body into a”happy state” somehow, someway… and am excitedly planning to incorporate some careful and mindful biking into my healing journey as we approach the warmer weather. To all my wonderful friends here, I encourage you to go out and discover what makes your heart soar – and then indulge. Live joyfully, love and find light everywhere you can! ❤ inspiring. Thanks, Robyn, for being a perfect, genuine, you. Two wheels of big soaring. Let your heart roam. Robyn, you inspire me yet again. I’m now in my happy state, waiting for tomorrow to come. As always to you friend, much love and many hugs! I admire your determination. I miss cycling. Between mountain biking and road cycling I used to ride about 150 miles per week. To and from work, to and from spinning class, racing mountain bikes. I loved it. Then life got in the way, the bikes were sold, though recently inline skates have taken their place. Well done on the bike, Robyn. I wouldn’t even dream of getting on a bike and I admire your courage so much in doing so. Just the uplifting message I need today. Thanks for your post. You live with a Tai Chi Master! Please my dear friend, please give him the opportunity to teach you. It is gentle, yet demanding. I am not in your situation, but I have hurt my knees and ankles in my life and Tai Chi is the one thing I have counted on from time to time. My Master taught me to think slowly …. Begin your Tai Chi ….at the moment of commencement. Every time I begin my Tai Chi, I will think of you. Ha Ha! That’s wonderful! I am looking forward to getting on my bicycle but the streets are a mess right now and it is going to snow…but soon! Remember when we put clothes pegs and cards on the fenders to make that cool sound on the spokes? Ride on, Robyn! You are an inspiration. I have a bike and have not been able to ride it because of my “issues” it but I am going to try and dust it off this spring. I would love to get one with a motor assist. Thanks for the push and wonderful posts. I really admire your courage, considering what you’ve been going through. A bicycle isn’t the safest, most kind thing you could do to yourself, but the freedom it gives is a wonderful trade-off. I’m glad that you’re reaching beyond the confinements of your physical problems and experiencing the exhiliration of “the open road”. Lord knows, we all need to feel that a lot more these days. Please do be careful though. Hugs a-plenty. Such a wonderful post to go with yet another creative and lovely shadow image! This photo of you says all that is in your heart. I know of what you speak but for me it is the horse… I live in a place where unless you are Armstrong, you are not riding a bike. But on horseback, you are free to wander anywhere the heart calls as long as you become warrior princess and pretend you are fearless of that ravine you’ve experienced before and lived to tell the tale. I have thought of you so often but haven’t been able to form much of a cohesive sentence or two. I know you are suffering thru the trials of loneliness in this walk you take and I too am enduring much the same…. an island that seems deserted and only what I KNOW left to help me along the way. All I’ve learned seems all there is now… Your input has been so very mindful and led me in other directions, I admit I have not yet been able to accomplish with this persistant pain but I never give up and pain is but an illusion that reminds us of one thing—that illusion we call our body. True we do incorporate her for awhile and must treat her with great care, something i didn’t do in my younger more thoughtless years, but now she is swaddled in as much care and feeding I can muster and I think from the inside, on the cell level, maybe she is getting a message of love? I am not sure yet but I know i can do anything… i leave you with that thought today— you can do anything. Maybe a small mare is in my near future that I can once again ride with the wind in my hair and the freedom to go about the earth here, the trees and fields, the stones and holes — her hooves will take the brunt not my ligaments that pull so easily and leave me incapable for weeks… stretched to the maximun without me knowing until it’s too late and the stretching is done. No one has ever been able to tell me why this is but as my hips contort, my pelvis bends in odd ways that should not be, maybe there is no true “answer” medically… I am different as are you, dear one, but look at this… we have found each other and I am but a screen away. Someone once said life is a matter of moments. So glad to hear about yours and that you shared your special moment. I really appreciate you positive attitude about dealing with your pain. I know how important it is. Someone very close to me struggles with similar pain issues. She too has a “don’t give up” attitude and I thank God for it every day. But it is hard. I hope you find relief soon Robyn. God bless you. Thanks so much … truly appreciate Tim! What a wonderful and encouraging accomplishment, Robyn! I’m so happy to hear you were able to take it for a spin, difficult as it would have been. Wishing you continued improvement and taking your bike out for more spins! I would be unstable on a bicycle right now, but someday I WILL be able to do it.